We share a common vision of providing excellence in education and to focus on the whole child. Our desire is to create an environment instilled with opportunities for learning, curiosity, and exciting challenges. We want to foster enduring friendships, encourage our children to dream and prepare for their futures, to develop responsibility and to commit to their own education. Our goal is that each student will achieve the skills necessary to succeed in life. Parental involvement is often seen as a cornerstone in a child's education. It can make a considerable difference to a child's school life, both in academic success and in general enjoyment at school. More than 85 research studies conducted over the past 30 years prove that kids do better when parents are involved in their schools. Grades are higher and test scores improve. As we unite under our PTA banner, we work together to demonstrate positive role models and to send a significant message to our children that we are committed to their success. Our PTA supports supplemental programs to that enrich student success, ensuring that they learn and grow as a whole person, educating students as 21st century learners who develop a love for lifelong learning. We value success not just academically but culturally, physically, socially and emotionally, developing our children into well-balanced members and leaders of society. We contribute to creating a warm sense of community. We believe that we provide a sense of belonging for all our members and that everyone should know that they are needed and respected. We organize events to bring our community together and to provide a variety of opportunities for families and teachers to socialize and connect. The passions children have are clues to what their lives will become. We want to encourage our students to embrace their dreams, to create a solid foundation of self-understanding and awareness. We need to champion their passions and foster a rich environment for growing big dreamers and individuals that feel confident and enthusiastic. We want our children to be an inspiration to others. Create a broader sense of community to foster an environment that is welcoming, inclusive and supportive of all our families, teachers, administration, staff and local retailers. Encourage parents and students to volunteer and support all PTA related programs, activities and school needs. Offer a proactive community service program that builds family togetherness, enhances school spirit and promotes humanitarian efforts within our community. Support the incoming leadership to create a seamless and productive transition for all stakeholders. Provide support for academic growth, cultural enrichment and community events through purposeful and well-planned programs and fundraising activities. Evaluate existing programs to build on our strengths and identify areas of improvement. Investigate new programs and activities to offer a diverse array of opportunities for our students. Improve communication to ensure that timely, accurate and cohesive information is being shared to the entire community. Streamline method of communications and evaluate content for effectiveness. Ensure that the community has appropriate channels for feedback. Beverly Hills Education Fund funds a world-class education in each of the five Beverly Hills public schools with financial support beyond what limited public sources provide. Click here for more information. 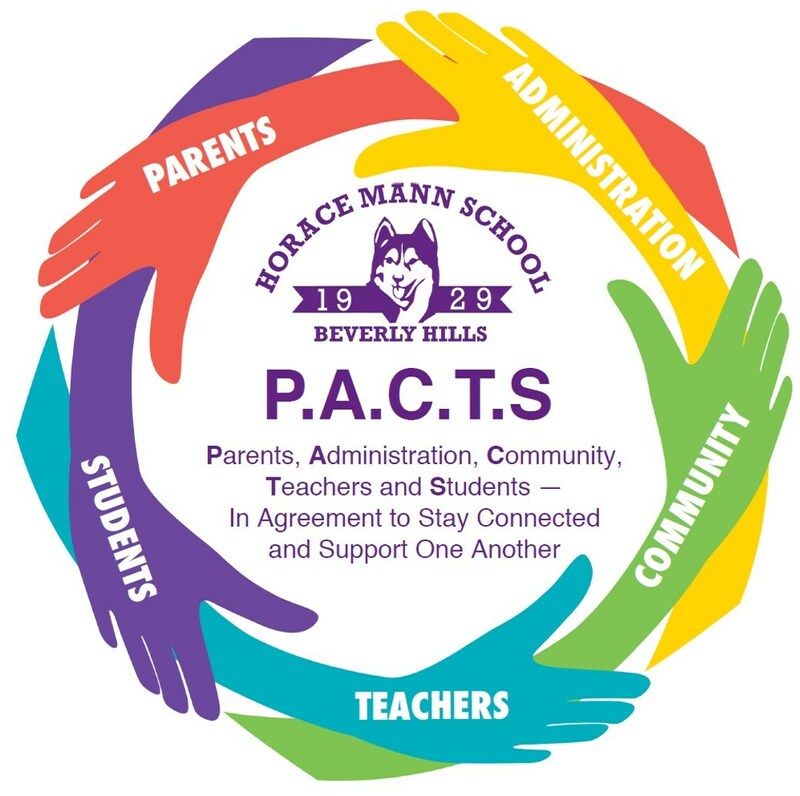 Husky Wear is Horace Mann’s spirit clothing that families can purchase at school events. Fridays is school spirit day – children are encouraged to wear purple or Husky gear. Acronym for Parent Teacher Association. PTA Council meetings serve as a channel for communication between the schools, the district, City officers, and the community. The meetings are open to everyone in the community. At these meetings you will hear updates from PTA Presidents from all five schools; BHUSD School Board President; BHUSD Superintendent, BHUSD Chief Administrative Officer; BHUSD; PTA Site Reports; City of Beverly Hills Mayor; BHEA President; BHEF Executive Director; City of Beverly Hills Recreation & Parks Department; City of Beverly Hills Library. PTA Council Meetings are held monthly on Thursdays at 9:00 a.m. in the District Boardroom at 255 S. Lasky Drive. Click here to see the meeting schedule. Elected group of parents who help lead the PTA. Here is more information. Meetings are held on monthly on Thursdays at times alternating between 8:30am and 6:30pm. At these meetings you will learn about current topics and have an opportunity to vote on key school funding issues. Please take the time to attend these critical meetings. Here is the schedule for the 2017-2018 school year. Act as liaison between teacher and parents and assist in organizing class related activities.